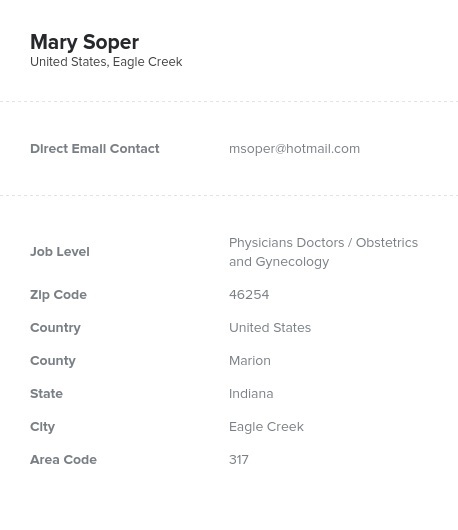 Look up OB/GYN experts with the help of this one directory full of the accurate emails, phone numbers, and contact information you need to deliver a great marketing campaign. Find gynecologists and obstetricians with this human-verified lead list today! Find the group of doctors responsible for helping women, including pregnant women and new mothers: those working in the OB/GYN departments of numerous hospitals, clinics, offices, and medical organizations. Gynecologists' and obstetricians' vital contact information can be found in this one resource, which pulls a vast, spread-out group of specialists together. In it, you can find the information you need to deliver an effective pharmaceutical or medical marketing campaign, from emails to titles to addresses. Gynecologists study the female reproductive system, whereas obstetricians often treat women specifically before, during, and after childbirth. Gynecologists perform pap smears, provide advice on STIs, and help women through cervical cancer, whereas obstetricians advise women throughout their pregnancy. Both types of physicians treat female patients at various stages in their lives. If you have a medical product, pharmaceutical, service, or piece of equipment that targets issues specific to females, one of the best ways to market it is to let gynecologists and obstetricians know. This targeted lead list can help you market a birth control product or contraceptive, show OB/GYNs your medical device, or recommend a technique for new mothers. Download this list and contact doctors with the specialties of obstetrics and gynecology today!